We live in a world where Eyeth is a fantasy. We live in a world where we are the minority. 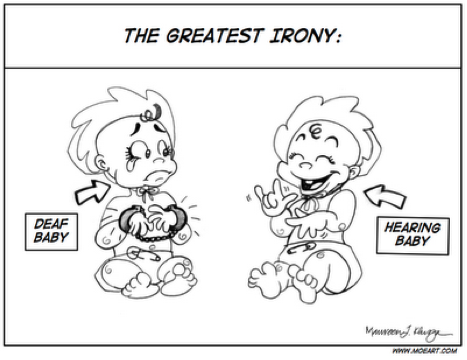 We live in a world of irony where hearing babies sign, and Deaf/Hard-of-Hearing are denied their natural language. yet we live in a world where Deaf/Hard-of-Hearing are forced to pretend. We live in a world where we become excellent actors and actresses. We live in a world where we become the best guessers. yet our needs are not heard. 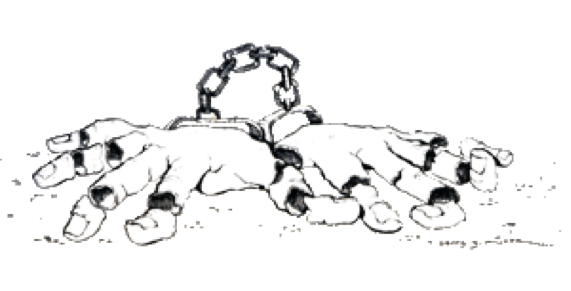 We live in a world of oppression, under constant attacks of Audism. We live in a world full of tears, pain, and misunderstandings. Only around 30% of English can be read on the lips. And that’s probably in an ideal situation: no mustaches, no mumbling, clear light, etc. On the other hand, sign language can be understood from across a room. You cannot learn to lip-read the same way you can learn to sign. Learning sign is very straightforward – there are specific rules for the vocabulary and grammar. But, becoming skilled at lip-reading takes year and years of experience and trial and error, which can all go out the window with a single mustache. Lip-reading is mainly a one-way communication method. Meaning that the hearing person can understand you if you speak, but trying to understand the hearing person can get pretty stressful. 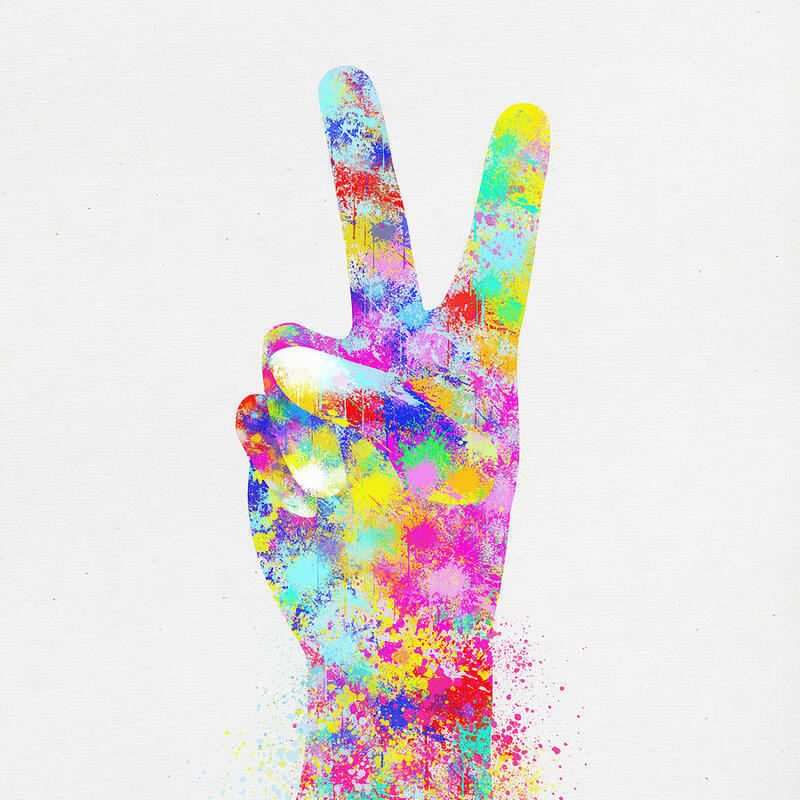 Sign language, though, even if you’re still learning, can be understood by both parties. Lip-reading is optimized by knowing the context of the situation. If a deaf person enters a spoken conversation with no idea of the context, they’d probably have a hard time catching up. But, with a signed conversation, a person can probably understand the conversation after a few seconds. If not, they can always ask. Learning sign language enhances your linguistic skills and cognition. This is true with any language. Languages are generally bound by rules and patterns, which people can easily detect. Lip-reading is less predictable and can vary from speaker to speaker. Learning to sign opens up a whole new culture. And a culture with people who will understand you better! Why didn’t I start learning earlier??? Or, I can just show them this link: http://www.chums.co.uk/blog/?page_id=601 Even then, this test is multiple choice! There is an assumption that all Deaf people grow up in similar types of households and use the same forms of communication. 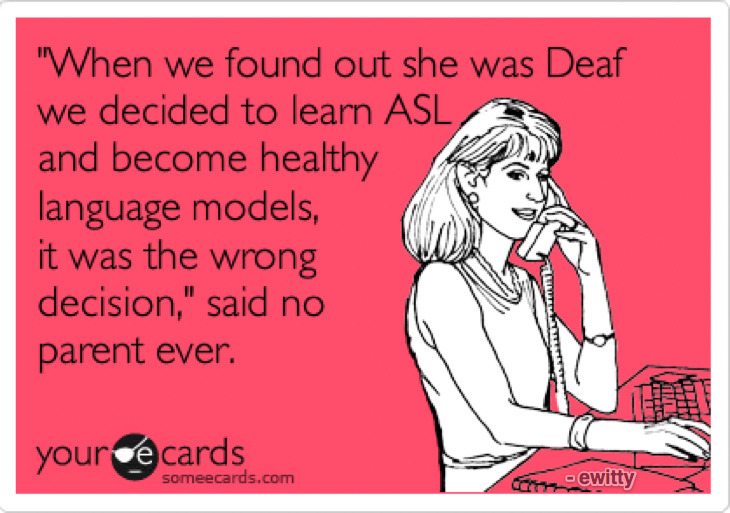 For instance, the idea that all deaf people grow up with ASL as their first language. However, most deaf children are born into hearing families, who may be unaware of ASL and Deaf culture. Although hearing families with deaf children have more access to the language and culture today, past generations have had limited access or knowledge of the information. With the lack of understanding the importance of ASL and culture, most hearing families taught their children how to speak, either due to their own personal desires or lack of other options. Both my mother and her friend were born in the late 1960s and into hearing families. My mother grew up in Riverside and her friend grew up in a small town in a different state. Both did not learn ASL as their first language, but they now know ASL and identify with being a part of Deaf culture. My mother was forced to learn how to speak and was not allowed to sign. She found this to be extremely difficult, and begged to learn sign language. She was then sent to another school to learn total communication, speaking and signing an English form of sign language, at the same time. Lastly, she learned ASL when she was in the 6th grade. Additionally, she was surrounded by mostly hearing family members, who did not know how to sign. Her mother was the only one who could communicate with her in sign language; therefore speaking English became her main source of communication in her household while growing up. In comparison, her friend grew up in a hearing family. They lived in a small town so there was not any information on how to raise a deaf child. Her parents’ only option was to teach her how to speak English. She did not learn ASL until she went to college. The transition between the two languages was not difficult for her. She can now sign ASL fluently but English is still considered her native language. Her family members do not know how to sign ASL so they still communicate with each other by speaking English. Now taking into consideration these life experiences that contrast with those who have primary grew up with ASL, we can see how my answer to this question is more complex than just “yes” or “no.” So my answer to the question is that in my household, we speak, and sign a mixture of ASL and English sign language. In short, I am not arguing that one communication system is better than the other, I just want to show you that when you tap on a deaf person’s shoulder and introduce yourself, just keep in mind, that they all grew up in different situations. They could communication in many different ways such as signing ASL or an English form of sign language, and/ or they may speak; the most important thing is to respect their communication system, because after all, it is a part of who they are. a) Strike him in the face — multiple times. b) Refuse to provide him with an interpreter during the booking, hospital, and jail time? c) Yell and continue to strike the driver because he does not respond to their yells? Are you disgusted yet? What if I told you the scenario wasn’t hypothetical? What if I told you a Deaf man in Oklahoma was beaten for 7 minutes because he didn’t respond to the officers. Aside from the obvious degrading, brutal and horrific treatment of another human being, he was also denied another one of his fundamental human rights: the right to language. His right to accessibility was stolen from him. This seems to be a common theme in the Deaf world. From something as simple as captioning a program, to something as crucial as providing an interpreter, the oppression that has followed Deaf people throughout history rears its ugly head daily in the form of limited access. No child should have to stand in a hospital room and convey a life threatening illness to their parent because the staff couldn’t be bothered to hire an interpreter. No human being should have to struggle through the fear and confusion of a situation such as an arrest, because their rights weren’t conveyed to them in their native language. Hearing children are encouraged to sign, while Deaf children are banned from even the smallest of gestures, forced to memorize tongue placements and diaphragm movements to produce sounds they themselves cannot hear. Language impairments. Cognitive delays. Depression. Anger. Mistrust. Just a few of the critical side effects of the ignorant world’s oppression of the Deaf. Accessibility is the first step to combating these issues. Every human being has the right to language, and no other human being has the right to take that away. Is the Demographic of Interpreters Changing? January 17, 2014 12:50 pm / 2 Comments on Is the Demographic of Interpreters Changing? I find myself finally done with the ITP program and in my new career as an educational interpreter. I was dreading sharing the inevitable story of how I started in my profession and the Deaf community, mainly because I have no friends or family who are Deaf themselves. 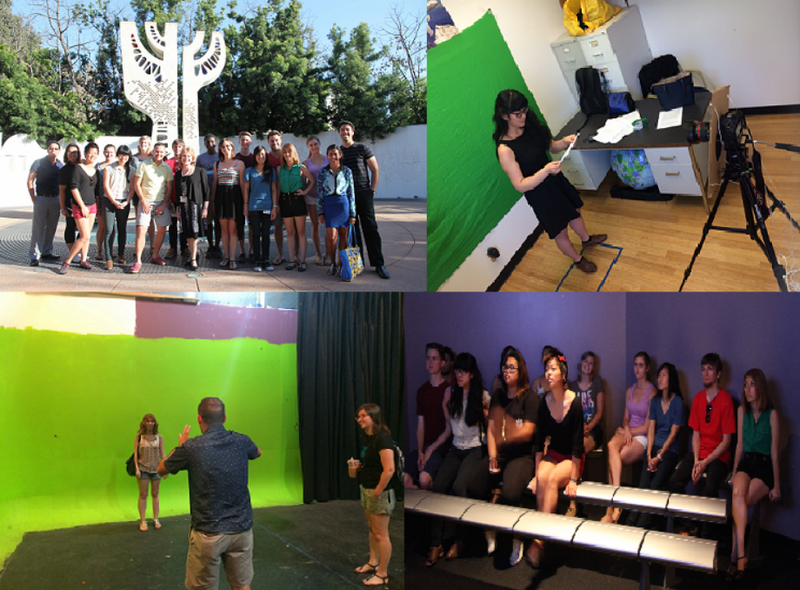 I found more often in my classes that the other students had some connection to the Deaf community before taking up study in ASL or interpreting. To my surprise I do not find myself in the minority any longer. Often I will be more in line with my peers in reason for starting interpreting and having no connections to the deaf community until after working in it. This made me curious. It’s interesting to wonder what this means for the profession and the community that it serves. While learning about deaf culture I was told that there is a line I must make because I planned to become an interpreter. Up until that point, I was a learning member of the community. The interpreter’s tile carries more weight and responsibility. Dealing with the deaf community and their personal lives and information. My teachers stressed the importance of being professional even in social situations and to be careful of the line between friend and client. Not to say that your clients Connor be your friends, only to be careful. 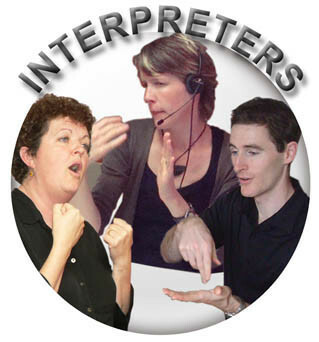 In this situation I feel there is more trust with interpreters that themselves are CODAs or that have Deaf family members and are accepted more freely than an interpreter that got into the profession from pure interest. I find this to be short sided. I can empathize with the Deaf community this feeling of camaraderie with interpreters that have grown up already in the Deaf world. Obviously I can never truly put myself in their shoes and will never understand the struggles they might have faced. But something should be said for the persons who have gone through the training and who have had to start from scratch. In my experience CODAs have always had a leg up on me. This has only made me want to work harder. I have met wonderfully passionate interpreters that have been from both starts. For the interpreters who have started from no previous experience and have bravely entered a whole new world with Deaf culture, there is something to be said. These people actively choose this profession. Maybe like me they are doing what they love. Hopefully you might consider intentions before you write off a NERD (Not Even Related to Deaf) like myself.